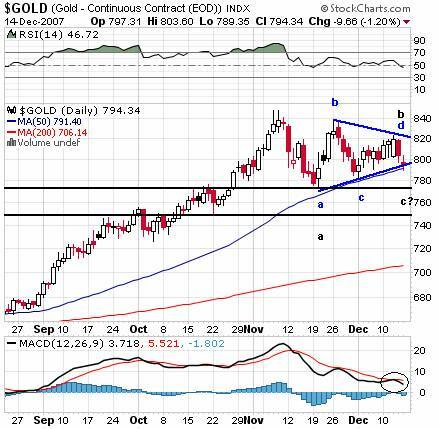 “I've been following a fourth wave triangle consolidation pattern in gold that, as the daily chart below reveals, is still valid. Taking out the 50-day moving average, currently about $784 in the futures, would be a warning sign and indicate a deeper correction to the $759-775 area. Silver also held up well … with the 200-day sma looking like strong support, an intermediate bullish outlook in silver is looking increasingly favorable even as a selloff to $13.50 continues to appear likely. The Fed did indeed take the cautious route, which only became my expectation after Treasury and the President through their hats in the ring and vowed to do some of the heavy lifting in the war on subprime foreclosures. The Fed did not decrease the spread between its target rate and the discount rate on top of the 25 bps cut, but it did announce a new credit facility designed to accomplish much the same end. The new credit facility that will begin on Monday is not designed to introduce new money into the banking system, as the Fed has been reducing liquidity by letting Treasury holdings mature. It will, however, allow banks to acquire funds at potentially lower rates, at least compared to LIBOR, and this may relieve some of the credit pressure without resorting to the heavy-handed tactic of lowering rates across the board. So, despite all the belly-aching about the Fed not conceding to the market's every wish, Bernanke may live to see his reputation restored if recession is averted and recovery is not too far off. It's mildly amusing if not outright laughable to think George W. Bush is convinced history will remember him in a favorable light, but a Fed chairman who clearly seeks to redefine the powers and limitations of the institution by utilizing nuanced tools that have never been fully explored may very well find a positive light in the eyes of posterity. Regardless, the disappointment from the Fed did not bode well for precious metals, though this wasn't entirely unexpected. The selling this week in gold, as shown in the chart below, continued to keep the fourth wave triangle pattern valid with crucial support coming in at the 50-day moving average as described here last week. The selling began on the MACD kissback mentioned to TTC members early in the week. If the triangle is going to prove correct, the question becomes whether the e wave low is in place or is another small low to come. Either scenario would be bullish for gold as it would make imminent the start of a 5 th wave move to new highs, which a move back above the 5-week sma at $800 would tend to confirm. The black count above is an alternate that keeps the recent selling corrective, but looks for a lower low in the $750-775 range. If long gold, keeping a stop just under the 50-day moving average will protect against this possibility. Silver has created a much more uncertain but still decidedly less optimistic chart over the past several months than gold, but nevertheless has strong support at $13.50. Should this level give, holding the summer's lows just above $11 maintains the likelihood of a powerful new rally to new highs in 2008. The question from a fundamental standpoint will be whether the forces causing this consolidation in metals will persist enough to take gold to it's lower target, or strengthen enough to take the bullish shine off silver and metals altogether. Again, as this update has repeated, the forces rallying the dollar are more technical and related to foreign weakness than to dollar strength, though strong retail figures and other bullish data threaten to reverse that pattern. Another more insidious danger is the very same inflation figures that many believe should be working in favor of the precious metals. Last week outright said that the agencies who create the data have the advantage and can use them to their favor, and now we've seen Bernanke's general inflation focus and unexpected acceptance of headline inflation working to raise Treasury yields and steepen the yield curve, an incredibly subtle but potentially effective approach toward smoothing out the difficulties in the banking and credit markets. As the crisis abates, metals will tend to test the limits of their crisis premiums, ultimately finding support at lower levels but remaining within their strong bull markets. Still, as belied by Merrill's much talked about mention of Citibank as “the short of 2008”, the subprime problem is far from over and the extent of the Federal Reserve's intervention may yet be unfinished as well. In fact, this “keeping the powder dry”, so to speak, on Bernanke's part may prove wise in months to come. 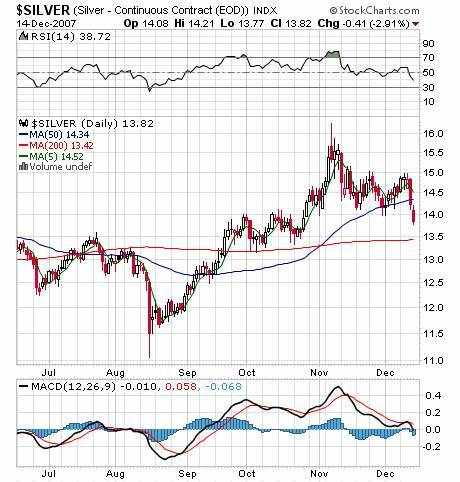 If the crisis returns, metals will again be a likely beneficiary. In the meantime, activity in the dollar relative the euro and the pound sterling may be the most important catalyst in metals through year end. This update is provided as general information and is not an investment recommendation. TTC accepts no liability whatsoever for any losses resulting from action taken based on the contents of its charts,, commentaries, or price data. Securities and commodities markets involve inherent risk and not all positions are suitable for each individual. Check with your licensed financial advisor or broker prior to taking any action.